A reviewers lot is usually a pretty happy one... we all have our likes and dislikes, and take the rough with the smooth. One of the roughs for me is that I am not a fan of organ trios. I quite often find that it starts to sound samey after a few tracks,and if pushed to name an album with this line up that I'd wish to play repeatedly I would pick 'Dynasty' by Stan Getz with the fantastic Eddy Louiss and guitarist René Thomas. I am now pleased to say that I can add Phil Robson's The Cut Off Point to the list, and will now be forced to re-examine my previous stance. Like me, many will most familiar with Robson's playing through his work with the longstanding group he co-leads with saxophonist Julian Siegel, The Partisans, and his longtime working relationship with his partner, Christine Tobin; but with this new album another side of Robson's musical personality is allowed to be revealed. If many of the settings get to hear the guitarist play lean towards the more contemporary developments in the music then his love and knowledge of the tradition is never far beneath the surface, and with his organ trio he unashamedly celebrates the organ trio in a very personal manner. Aided and abetted by a stellar partnership of Ross Stanley and Gene Calderazzo we are taken on a journey that moves forward as well as casting a backwards glance. From the opening 'Thief' the trio swing hard, with Robson easing into his solo in such a relaxed manner and never sounding hurrried, spinning melodic lines that float above organ and drums, and that for me is the success of the album. A set of memorable themes that stand alone, without a standard in sight. In fact seven of the eight tunes are written by the guitarist with the exception being 'Dimi & The Blue Men' by David Liebman, and it is the strength of the material that retains the attention throughout. Apart form the opener there are other powerhouse performances with the pulsating rhythmic turbulence of the title track and 'Vintage Vista', and the tightly controlled and funky 'Ming The Merciless' whilst the more spatial side of the trio is heard on 'Astral'. 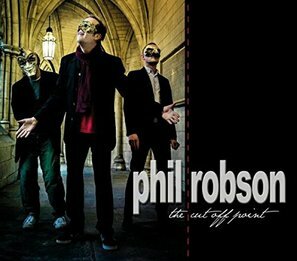 This is an album brimful of exciting playing and solos, and some memorable themes that all lend themselves producing a stimulating and varied set that shows that there is a lot more to come from Phil Robson when he takes the opportunity to branch out.